Michael Short joined the faculty in the Department of Nuclear Science and Engineering in July, 2013. He brings 15 years of research experience in the field of nuclear materials, microstructural characterization, and alloy development. His group’s research is a mixture of large-scale experiments, micro/nanoscale characterization, and multiphysics modeling & simulation. The main areas of Short’s research focus on 1) Non-contact, non-destructive measurement of irradiated material properties using transient grating spectroscopy (TGS) more, 2) Preventing the deposition of deleterious phases, such as CRUD in nuclear reactors, as fouling deposits in energy systems more, and 3) Quantification of radiation damage by stored energy fingerprints more. This last project was recently selected for an NSF CAREER award. Fouling, or the unwanted deposition of species on mission-critical material surfaces, is an enormous problem affecting industries throughout the world. The impediments to heat transfer, increases in pressure drops, and accelerated corrosion cost most developed nations including the United States 0.25% of their gross domestic product (GDP) each year, which amounted to $43 billion in 2013. We use the Lifshitz theory of van der Waals (VDW) forces to design material coatings to eliminate or delay the onset of fouling in nuclear reactors, geothermal heat systems, and other energy applications. See more of what we do to understand and eliminate fouling here. As a wise man once told me, “stuff tends to be made out of materials.” The continued performance of anything depends on the continued performance of the materials that comprise it. In the nuclear world, however, many major issues take months to decades to appear, making the licensable testing of nuclear materials incredibly time consuming and expensive. We use transient grating spectroscopy (TGS), a picosecond, ultrasonic laser excitation technique, to measure thermo-elastic material properties in-situ, or during irradiation. This can help us discover when materials undergo changes like void swelling, which can take 10-20 years to appear in a reactor, within hours using accelerated testing. It also allows us to take month-to-year long experimental testing campaigns, and shrink them to a single in-situ experiment lasting a few days. See more of what we do with transient grating spectroscopy here. The concept of "damage" to a metal remains difficult to quantify. Metals are among our most important structural materials, providing the backbone to everything from buildings, to bridges, to nuclear reactors. If we had a universal way to measure damage, we would be able to better predict when metals would fail, measure their degradation during service, and design new metals to be both longer-lasting and more economical. The use of stored energy fingerprints is proposed as a way to quantify damage to metals from any damaging process. We focus on radiation damage as an ideal way to make all the types of defects found in metals. A two-pronged experimental and simulation approach will be used to quantify and understand these stored energy fingerprints, relating them directly to the defects created by damage. 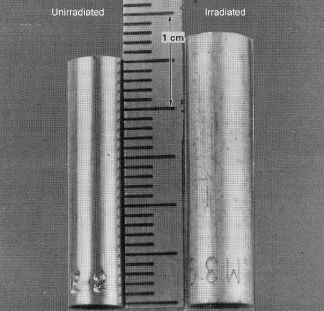 Immediate applications of this work range from reconciling the differences between ion and neutron irradiation, to predicting material property changes due to radiation damage, to verifying the historical usage of uranium enrichment centrifuges. This project is in its infancy, check back regularly for more updates.